A hectic working life, the loss of a parent and the fear of returning to education after a 30 year gap didn’t stop a tenacious mother of three from graduating from Bangor University this week. 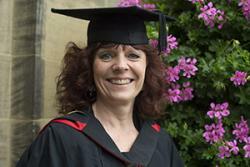 Alison Branch, 49, from Longframilington, Northumberland graduated with an MSc Applied Behaviour Analysis degree after completing the course through distance learning. Alison also scooped the Jayne Carslake prize for the best Applied Behaviour Analysis dissertation. Alison qualified as an Occupational Therapist in 1987 from Oxford, and worked in London for most of her career, but later moved to Northumberland with her husband to raise her three children. She continued: “I chose to study at Bangor’s School of Psychology because of their excellent reputation and also their video link facilities which enabled me to complete the course at a distance. “Three months after I started the course, my mother sadly passed away. This was very hard as we were very close, but the University helped me enormously by reorganising work and exam dates. Alison is currently studying for the Board Certification in Behaviour Analysis.